One of my favourite dishes in the whole world is Cambodian Noodles or Nom Banh Chok. A bowl of these with a friend at the Russian Market in Phnom Penh, with a Cambodian iced coffee made from condensed milk is the stuff of my dreams. If you want to know how to make authentic Cambodian noodles you can see a video here. Back in the UK we eat a lot of Asian food in our house: with my years of living in Southeast Asia and Hannah's Chinese heritage I guess it's not surprising, plus I am able to buy Asian ingredients when I travel. Noodles in some form make it on the household menu most weeks, often on a night before a grocery delivery when we need to use up lots of odd veggies from the fridge. Tonight I had a vague plan to cook something noodley but when I opened the fridge I saw a bag of left-over cooked spaghetti from Monday's bolognese. I hate waste so decided to see how Spaghetti worked in place of noodles. It was delicious! So, here is my recipe for very un-authentic but quite delicious veggie 'noodles' with left-over spaghetti, another money-saving tip from the Kemps Kitchen! Add 2 tsp medium curry powder and cook for about 5 mins, adding a few tbsp water if it gets too dry. Cook until the veg is almost soft but retains some bite. Add in 1 chopped courgette near the end. Throw in some leftover spaghetti (of course you can use any noodles, soaked or cooked according to the packet instructions) and heat through. Add more water if necessary to give a soupy consistency. Top with chopped peanuts, a chopped fresh red pepper, some chopped coriander and some crispy friend onions (mine come in a jar from an Asian Supermarket). Serve with extra chopped chillies on the side. Hannah had thirds. Our serious German lodger, who doesn't like spicy food, had two helpings and said it had a 'well-balanced flavour'. Hilarious. I shall take that as a compliment and judge the meal to have been a success! The Royal College of Midwives has recently signed a contract with UNFPA Bangladesh to help strengthening the Bangladesh Midwifery Society (BMS) through a twinning project, similar to what we have implemented in Uganda, Cambodia and Nepal. We are calling this new project BOOST: Bangladesh Midwifery Society Opportunity for Organisational Development through Twinning. Initially for one year, the project may extend for a further 3 years and is being funded by DFID through UNFPA. During this first phase we will help BMS to undertake an organisational capacity assessment using tools from the International Confederation of Midwives and walk through a series of other activities together such as situational and stakeholder analyses and an election of office bearers. I visited Bangladesh in October 2016 to meet BMS and to attend the Midwifery Services Framework Workshop that was being hosted by UNFPA and ICM, At that time I visited various clinical sites and educational facilities, met funders and beneficiaries, undertook an intial risk assessment and began to get a feel for what it might be like to have a programme presence here. Since then, we've been negotiating contracts, developing job descriptions and begun recruiting for the personnel we need to deliver the agreed outcomes (in addition to completing our recent MOMENTUM project in Uganda). On Friday we appointed a volunteer for a six month placement who will start her new role with BMS in September. Next week we will be interviewing for a consultant to help with project management and hope to soon fill the Global Projects Officer post at the RCM. Meanwhile, I have been asked to take some time to pause and reflect on the RCM's programmes, processes, achievements and challenges thus far and to publish and disseminate our work. This takes time but we've made a start and hope to have some published articles soon to show for it. Right now, I've just arrived back in Bangladesh for a week of strategising with BMS. I hope to be joined by the ICM's technical advisor Pashtoon Zyaee, visa permitting, on Wednesday. 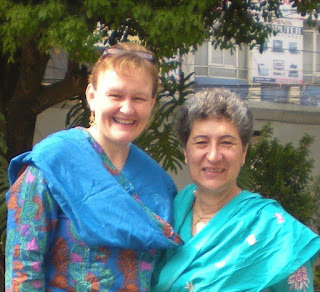 Pashtoon and I have worked together before in Nepal and it will be a joy to do so again. If she doesn't make it, I'll be a very busy woman over the next week! Other things to do whilst I'm here involve setting up arrangements with VSO to house and provide security for any RCM volunteers visiting the country and catching up with Sue Lloyd, a friend from Cambodia days. I'm still recovering from jetlag after visiting Canada and the USA so will be trying to ensure I get enough sleep. I am currently in Toronto, attending the International Confederation of Midwives 31st Triennial Congress and the preceding council meetings. It’s a fantastic opportunity to meet midwives from all over the world and to consider the role of the Royal College of Midwives in strengthening midwifery globally. It’s particularly special to be here with our twinning partners from midwifery associations in Cambodia, Nepal and Uganda. Since April 2017 I have travelled widely around the UK; twice to Cardiff for global health events, to Edinburgh and London for the launch of a new leaflet for nurses and midwives interested in working internationally, to Liverpool to give a keynote lecture for International Day of the Midwife, teaching student midwives at Kings College London, to Oxford for the RCM’s Zepherina Vietch Lecture, to York for another keynote lecture and to Salford – to talk about writing up some of our work as a PhD! I have also travelled to Uganda to close the MOMENTUM project, which was implemented in partnership with our twinned association The Uganda Private Midwives Association. This project aimed to develop a model of midwifery mentorship for Uganda. The final evaluation found that the project had achieved its objectives and also had many unforeseen benefits. I coordinated the closing workshop and remaining data collection and co-hosted the international/Ugandan team conducting the final project evaluation. We also conducted a needs assessment to inform any future projects and facilitated a development opportunity for one of the RCM’s staff members, Jack Andrew (Data Analyst), to visit Uganda and experience and understand our global work. Whilst in Uganda we also offered peer support to RCM members living and working there long-term. I have been involved in the RCM’s ongoing review of its global work – since February we have had a task and finish group to develop the RCM’s global strategy. This work will be presented to the RCM executive later this month. We have also been developing resources, such as the leaflet mentioned earlier, for our members who have an interest in global work. So, as for many others, this has been a busy but fruitful few months. Sadly our global projects officer, Eleanor Shaw, has moved on from the RCM and I want to take this opportunity to thank her for being such a wonderful colleague, for keeping me sane and for helping to shape and develop both the MOMENTUM project and the RCM’s wider global work. We wish you well and will miss you Eleanor! We have been successful in getting funding from DFID through UNFPA to start a new twinning relationship with the Bangladesh Midwifery Society and so I will be travelling to Dhaka after my time in Canada, to undertake activities to establish the new partnership. Meanwhile, here in Toronto I will be leading a symposium with our twinning partners on the long-term impact of midwifery association twinning. We also have a poster presentation about the MOMENTUM project and I will be representing the RCM on our exhibition stand at regular intervals. It will be a very busy 10 days of networking and meetings, so all prayers and good wishes for stamina are appreciated! Thanks for your interest in our global work. The world needs more midwives! Looking back over the past almost 4 years as Global Professional Advisor for the Royal College of Midwives, there have been several periods of intense activity during which re reassure ourselves that calmer waters are ahead - only those peaceful pools seldom occur. The past few weeks have been packed with logistically complicated programmes and the days ahead offer little respite. However, we wouldn't have it any other way. We know that investing in midwifery is the most cost-effective intervention in public health and working with our partners so that, in the future, every woman and newborn receives accessible, acceptable, affordable and quality midwifery care is an enormous privilege that drives us to respond. Over the past few days, five of our Ugandan midwife partners have come to the UK on an exchange visit. Three of them had never travelled outside Africa so we knew they would need careful nurturing to best make use of the experience. We therefore arranged for them to stay in homes rather than hotels and to make sure that they were always accompanied on visits. We exposed them to as many British experiences as we could - traditional tea rooms, Lancashire Hotpot, Tube Trains, propeller planes, high speed railways and the the M25, Poundland and Primark, London buses, village greens, churches and castles, country parks, crumble (lots of it!) and of course, our unpredictable Autumn weather. We reassured them that it was safe to walk through long grass without fear of snakes or lions; we instructed in proper escalator etiquette, equipped them with coats and warm jumpers (donated by kind friends and colleagues) and spent weeks prior to their visit cooking and freezing tasty traditional meals and bakes whilst also trying to provide some more familiar flavours of home. Walking in a Kentish Country Park. Why don't we eat the ducks?! Of course this visit was not just about sharing cultural experiences. Our programme 'MOMENTUM' is helping to develop a model of midwifery mentorship for Uganda. We therefore planned as much exposure (as was possible in a short window) to UK midwifery and mentorship as we could for our twins. Together they visit hospitals, birth centre and universities in Kent, London, Surrey and Northern Ireland. They met policy makers, professional and regulatory bodies, midwives in many different roles. maternity support workers, student midwives and lecturers - and of course - women and their partners. They observed PRROMPT training, explored database systems, had presentations by Skype from Scotland and marvelled at student midwifery societies. Together we did 2 conference presentations and met ministers of state, funding bodies, the President of the International Confederation of Midwives and our own chief executive, Cathy Warwick. We also took time to reflect formally on these experiences and make individual and collective work plans for how this learning will influence our MOMENTUM programme and midwifery in Uganda. It was a time to deepen individual twinning relationships and we were delighted that almost all of our 7 UK MOMENTUM midwife consultants were able to give time out of their busy lives to meet and host their twins. Introducing our friends to tube travel! Two of our Ugandan colleagues work in government health centres, delivering up to 21 babies per days in just one room with a total staff of just 13 midwives and one doctor to cover all aspects of maternity care. Compare that with my local NHS Trust in Kent - a similar number of deliveries but with its own free standing birth centre containing all home comforts, a referral hospital with 14 delivery rooms and staff of almost 300 midwives plus countless doctors and other professionals. Over and over again we heard our guests say 'you have so much space' and goggle at the wastefulness of resources through away after each use when every swab, glove and instrument would make the world of difference to their constrained services. Perhaps every midwife from the UK should spend some time in a low-resource country to appreciate the privilege that it is to work in our own settings. I am halfway through a 2 week visit to Uganda with the RCM’s MOMENTUM project. As the RCM’s Global Professional Advisor I am also the programme leader and responsible for ensuring that we reach our objectives and reporting to our donors (UK-Aid through THET). (right) Kade Mondeh, Consultant Midwife from London, with midwife Brenda who has been trained as a mentor during this project. She came in to work on her day off to go through the mentorship paperwork. Thank you Brenda! Our programme is a pilot project, testing whether mentorship for midwifery students by midwives works as a concept here in Uganda. There are three separate but connected work-streams: first, helping the Ugandan Nursing and Midwifery Council to develop a national standard for mentorship; secondly, developing a work-based learning CPD module for midwives to train as mentors; thirdly, working in partnership to improve the clinical learning environment in four pilot sites that represent a breadth of maternity care provision (public, private and faith-based). The project finishes in April so the next few months are pivotal in ensuring that all steps in the model are established and widely communicated and evidence collected of any change that’s happened thus far. We also want to ensure that these changes are sustained as far as possible and we’re pleased that our long-term partnership with the Ugandan Private Midwives Association makes this more achievable. Student midwives from Jinja and Mengo schools of midwifery who have received mentorship during this project. Robina, the lead midwife from this Level IV Health Centre, is twinned with Kade Mondeh, a consultant midwife from London. Robina has participated in our workshops and has trained as a mentor. Four other midwives at this site have also been trained by Robina and Kade. There are up to 3000 births per year at this clinic and 80 antenatal visits per day as well as running the postnatal ward, the family planning clinic and other services. All this with a total of 5 midwives, between 1-3 per shift. And still we complain in the UK! Thankfully I don’t have to do this alone! Six experienced UK midwives, all RCM members with different and complementary skills, are twinned Ugandan counterparts and responsible for different areas of the programme (see here for an earlier blog about our fabulous team http://kempskronicles.blogspot.ug/2016/01/building-momentum-in-uganda.html ). Additionally, back in the UK, our Global Projects Officer and the wider RCM team provide essential support and guidance. This time I’m here with our UK ‘twins’ and we’ve been out in the field this week, visiting all the pilot sites and reconnecting with our Ugandan twins and wider stakeholders. I’ve travelled many miles and the roads are dry and dusty – there’s been little rain here for 6 months and it’s unusually hot – up to 34c during the day. Not as hot as Cambodia but still sticky and no aircon or other creature comforts! Thankfully our guesthouse has a good water supply and the dust can be washed away at the end of the day. Our Ugandan 'twins' visited the UK in October and December (one of them even met HRH Princess Anne with me!) and this has been a great time of reunion, sharing stories and memories. Yesterday our twins hosted a lunch for us in Mukono with traditional Ugandan food, dancing and an enormous cake! This week I’ve had meetings at the Ministry of Health and the Ugandan Nurses and Midwives Council, visited hospitals, health centres and clinics within 100 mile radius of Kampala, met with tutors and students at midwifery training schools and universities and spent much time reflecting, discussion and planning with our team. Next week we hold a workshop where we bring all the project participants together to reflect, learn and plan together. This time we are co-teaching with our Ugandan colleagues to ensure that they can cascade the mentorship programme in their own sites. We’re trying to model ‘learning on your feet’ in the workshop with minimal presentations and lots of participation and movement; a counter-cultural approach to learning! The workshop also gives us a chance to reach out to RCM members who are in Uganda for the longer term; they have helped us to shape our programmes in Uganda and the support we offer to our volunteers. We’re proud of them and the work that they do. We look forward to welcoming Professor Grace Edwards, Diane Lockheart and Rachel Haddock (Fishy) tomorrow and hope that they find the stories of success and challenge, the learning and reflection and the future planning helpful and inspiring. One of our volunteers is also using her long weekend off to fly north to Arua, an underserved and remote town on the border with DRC, to visit and offer support to another RCM member (Kate Quarrell) who is teaching midwifery there. Sisterhood rocks! I’m grateful to everyone who supports this project and me personally. Thanks for reading.